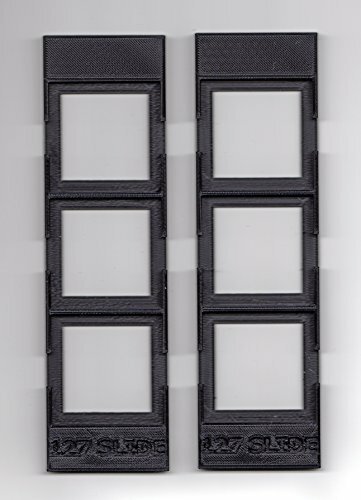 127 slide holder/adapter for Epson Perfection V750/700 Film Scanners by Negative Solutions Film Holders at EISF. MPN: 127-E7. Hurry! Limited time offer. Offer valid only while supplies last. This is a 127 slide holder for use with the Epson Perfection Epson Perfection V700, V750, V800 and V850 flatbed film scanners (US Patent Pending). This is a 127 slide holder for use with the Epson Perfection Epson Perfection V700, V750, V800 and V850 flatbed film scanners (US Patent Pending). This was CAD designed and manufactured for use with the obsolete 127 film format. 127 slides were relatively uncommon and were typically referred to as "Super Slides." 127 slide mounts were 2" x 2" (50.8 x 50.8 mm) and the image opening was 40 x 40 mm or 38 x 38 mm. This adapter is for use with 2" x 2" (50.8 x 50.8 mm) mounted 127 slides. Cardboard mounted slides occasionally varied in their outer dimensions. Please make certain that the slides you intend to scan do not have outer dimensions that exceed 2" x 2" (50.8 x 50.8 mm). This slide holder is designed to fit inside the stock 120 film holder that shipped with your Canon or Epson scanner. Use of an OEM holder may not be necessary with your scanner, but it aids in proper positioning and helps avoid blocking calibrations slots on the scanner bed. If you order more than one holder from us, we will refund excess shipping charges.